I have been happily watching the small spider grow and weave - through the clear plastic of the stool I use of the back porch as a foot stool and occasional table. It was clearly a theridiid (Family Theridiidae), and we have plenty of the commonest theriidid in the world, the American common house spider (Achaearanea sp.) on the verandah. I'll introduce them below. This morning I noticed that she was getting to be a very very large Achaearanea. The deadly red-back spider (Latrodectus hasselti) is the same shape. Surely I couldn't have been that stupid? I was. I turned over the stool and the distinctive red stripe on the pure black back was clear to see. Around her were the bailed up bodies of spiders, a favourite prey of red-backs. Beneath her was a recently shed skin. Adore every spider as I do, I have to be realistic. We have children visit and play on that verandah regularly. She couldn't stay for me to watch. But I hadn't been at any real risk with her there under the foot stool. Red-backs haven't killed anyone for about 50 years - not since the anti-venom became available. 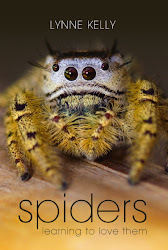 Neither have their very close relations, the other deadly widow spiders, including the American Black Widow (Latrodectus mactans) and other highly venomous members of the Latrodectus genus. But the bite is apparently horrific, although the spiders are notoriously shy. I knew that she wouldn't rush at me or attack - that only happens in movies. It is an unfortunate coincidence of nature that her venom is so dangerous to us, as well as her intended prey. The harmless little theridiids, which are probably the most common spiders around houses worldwide, are the Achaearanea. They tend to be pale and well hidden in their messy tangle webs. They are great to watch - they hunt and catch prey way larger than you would think possible, the egg sacs sit in the web and then hatch with the young staying with the protective mother for a week or two. They mate in the open, and put on quite a show. I'll be blogging all this during the summer. But here is an Achaearanea, just for introductions. They have only six eyes, as can be seen on the front. She is only about a centimetre in body length, but with extraordinarily long legs. Most of mine never make it to mating - birds regularly grab onto the frame of the glass door panes, and systematically pick off every spider as they do the rounds. 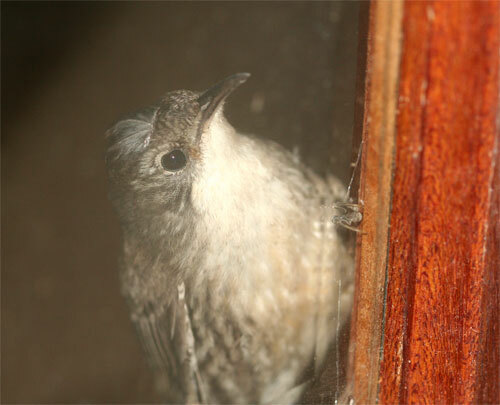 Below is a white-throated treecreeper, as I saw her through the door panes, carefully making sure that she didn't miss a single arachnid morsel. At the moment, I have no spiders on the front door, thanks to the attention to detail paid by a pair of white-browed scrub wrens nesting out there, who I see most days checking out the window panes for new residents. These guys are the Number One enemy!